52 - Lawrence Goldsmith, Sr. Welcome to Maple Hill Cemetery, officially established in 1822 when the city purchased two acres from LeRoy Pope. There is evidence that the property had been used previously as a burial site with the earliest surviving headstone dated September 17, 1820. In subsequent years an expanding city acquired additional acres in small increments. A major addition in 1873 provided for Hebrew and Catholic burial grounds. In 1901 the cemetery got its official name—Maple Hill. The cemetery presently encompasses 100 acres and is on the National Register of Historic Places. Maple Hill is in truth a three-dimensional record of Huntsville and Madison County’s history. 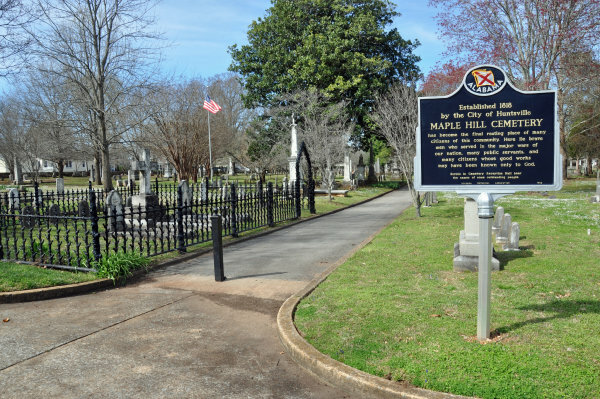 The grave sites of five governors, five United States Senators, ten United States Representatives, numerous war heroes, and several city founders can be found here. Women also have a strong presence from pioneer days, through the Civil War, into the Temperance and Women’s Suffrage movements, and to cultural and philanthropic activities. I am the cemetery Sexton, Bell Ringer, Gravedigger and Tour Guide. 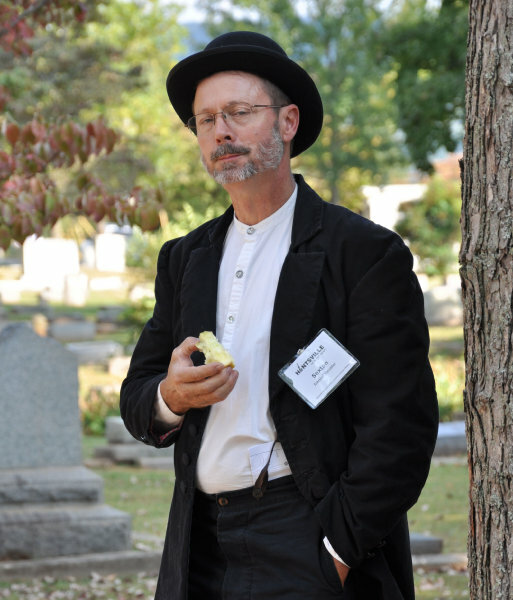 This tour is sponsored by the Huntsville Pilgrimage Association and focuses on the “historic” section of the cemetery. The default tour includes approximately 60 graves sequenced to minimize walking. 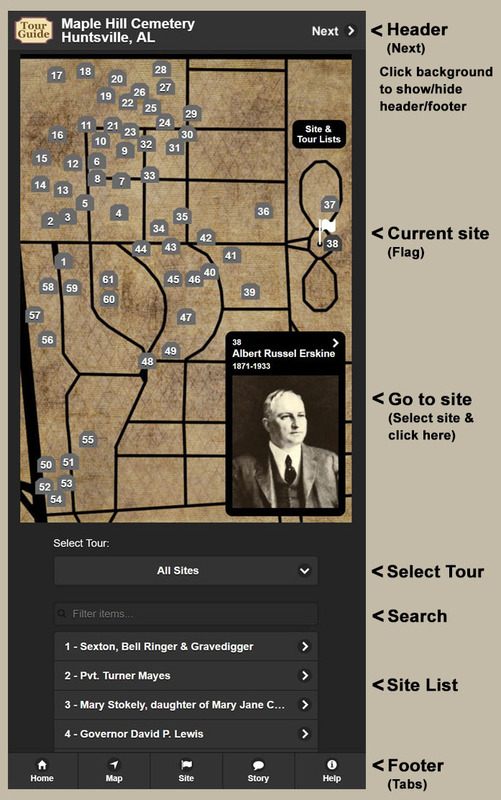 Or you can select a shorter tour featuring Highlights, Governors, Civil War figures, Women or Mausoleums on the map. The next stop on a tour will be marked with a flag on the map. Click the header or the Sites button for pictures with orientation markers to help you find the grave in the cemetery. Click the header again to see or hear the story of the person who is buried there. Be sure to scroll down the Story page for pictures and more information. Keep clicking the header to cycle through each of the graves of the tour. If you are looking for a specific grave, tap a tombstone on the map or one of the names in the list at the bottom of the map page. Scroll down this page for more instructions. You may also find the Help page useful. If in doubt, tap the header.